If you have been searching for vocal exercises for singers to increase range, then you will find this particular program very useful. I had created this program for the Tanzanian Swahili-speaking market, but even if you do not speak Swahili you’ll understand what to do by simply following the demonstrations that precede each run. However, there’s a breathing exercise labeled Zoezi La Pumzi included here, that gives instruction in both English and Swahili; and you’ll find video demonstration on how to do the lip rolls and tongue trills on my Facebook page here. 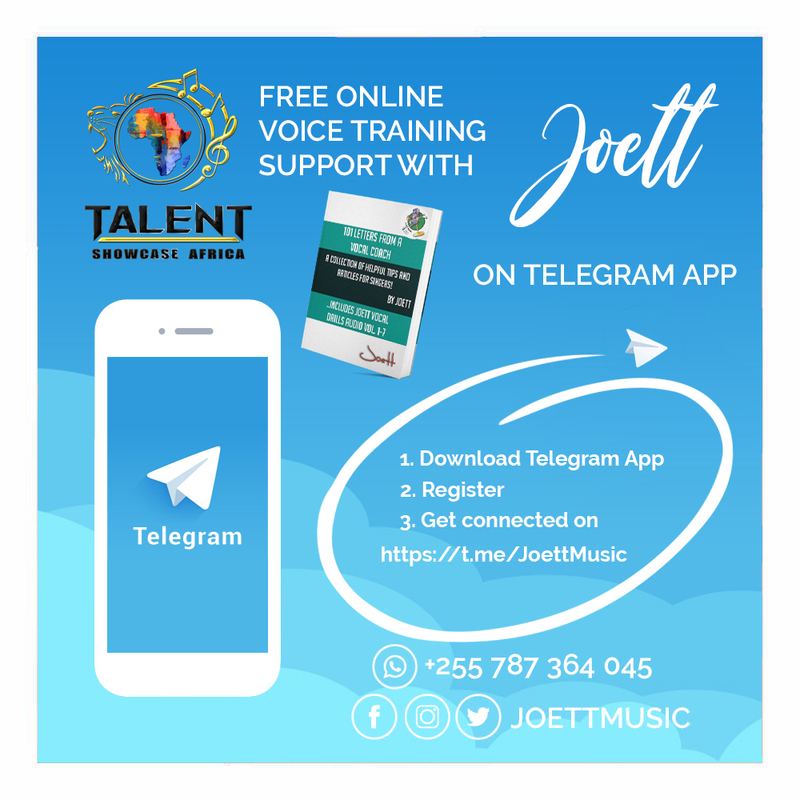 Please view the video on top of this page (illustration in English) for guidance on how to log-in to download Joett Vocal Drills Vol. 1-7 from Mkito.com. If you're outside Tanzania, all major credit/debit cards are accepted on the Mkito platform. Joett Vocal Drills Vol. 1-4 is a set of vocal exercises for singers to increase range, the duration of which is approximately 30 minutes, and they will improve and develop the quality of your voice AND increase your range very quickly with consistent training. Furthermore, I provide FREE online support and tons of videos straight out of my classroom on my Telegram Channel here, wherein you’ll also find a link to join my Telegram group Joett Voice Studio. (You'll need to first download the app). Joett Vocal Drills Vol. 5-7 is a guitar driven set of riffs for singers set to the song Color Me Beautiful from my acoustic pop EP Twisted, which will help you to begin applying your training to delivering a song. Only attempt this set of exercises several weeks down the line, once you’ve had sufficient training on Volumes 1-4. Just for reference, Vol. 6 is in a lowered key. And so if you wanted vocal exercises for singers to increase your range, my prerecorded piano scales Vol. 1-4 are a must-have, and for more handy tips in paperback please grab a copy of my new book 101 Letters from a Vocal Coach, available from Amazon, Barnes & Noble and Lulu. I can also recommend that you purchase the voice training product Superior Singing Method—which I frequently use in my classes—that comes in male and female range prerecorded tapes. Excellent for home use! And before you go, please spare a moment to take a look at the Before & After video clip of my student Japhy Ross. His musical journey and growth with me as his tutor has been outstanding, so much so that I felt I needed to take this to Africa. And so I partnered up with Namibia's Nam Radio to create Talent Showcase Africa. I'm so excited and passionate about this new project as it will give me the opportunity to work with talent right across the African continent. If you like this article, please be so kind as to share on your social media using the links below. And wherever you are in the world, you can learn to sing via Skype. You'll find information on my Personalized Skype Lessons here.